The first tentative steps towards peace in Yemen are being taken in Geneva. The UN-sponsored talks between the Houthis and the president, Abd Rabbuh Mansur Hadi, come at a critical juncture. Saudi-led air strikes coupled with a naval and land blockade have trapped Yemenis, who are seeing food and water supplies dwindle. But the kingdom, leading a military campaign in the region for the first time, has been unable to defeat the Houthis. This new Saudi assertivenesss, under Salman bin Abdelaziz who ascended the throne in the spring, will have repercussions across the Middle East. Its first test in Yemen does not so far bode well. Having regionalised the conflict, however, any political deal will require Riyadh’s acquiescence. The Saudi-led intervention started on 26 March with an air campaign, ‘Operation Decisive Storm’, in reaction to the entry of the Houthis (a Shi’a offshoot) into Aden, where Hadi had taken refuge. The Houthi advance was facilitated by an alliance of convenience with the former president, Ali Abdallah Saleh, and military forces allied with him. Hadi, who fled to Riyadh, called on Salman for assistance. Although the official aim of the Saudi-led coalition was restoration of Hadi’s presidency and neutralisation of the Houthi threat, Saudi Arabia has its own security concerns. It perceives the Houthis as a proxy of its regional opponent, Iran, and regards Yemen as within its sphere of influence. The Houthi-Saleh coalition has acquired ballistic missiles which threaten the Gulf region, including vital oil-shipping lanes, and the Houthi takeover of strategic Yemeni cities could spill over to Saudi territory. It challenges long-held Saudi policy towards Yemen, based on containment and preservation of a domestic power balance. Saudi Arabia’s action is also driven by the challenging regional context that unfolded in the aftermath of the popular uprisings in several Arab countries in 2011, which Riyadh viewed with suspicion and repugnance. Saudi Arabia feared the removal of predictable, allied Arab regimes and the increased agency of Islamist political movements that challenged the Saudi Wahhabi interpretation of Islam. But above all Saudi Arabia perceives the changing political constellation in the Middle East through the prism of its geopolitical rivalry with Iran, which has increasingly taken on an overtly sectarian tone. This competition has prompted both powers to see fragile Arab countries—where the legitimacy of the regime is contested and national identity fractured—as proxy battlegrounds. It has been played out in Lebanon, Syria and Iraq, where Riyadh also fears growing Iranian influence. Saudi Arabia has therefore struck the Houthis to reassert its regional standing. Yet while Lebanon’s Hizbullah really is a proxy of Iran, the Houthi link has hitherto been weak: while the Houthis have looked to Iran for support, Iran has treated them merely as a spoiler against the Saudis, providing minimal support. So while “fighting the Iranian mirage, the Saudis may have inadvertently made the genie real”. These events appear even more threatening to the kingdom when its long-time ally, the United States, is engaged in a rapprochement with Iran via the nuclear negotiations. The Saudis are anxious that the looming American-Iranian settlement will further empower the Iranian regime. The president, Barack Obama, recently reassured the Gulf Arab allies of an ‘ironclad’ security commitment in the aftermath of a possible nuclear deal. But Saudi Arabia is still concerned that Iran’s expansionism in the region will remain unchecked. It seems obvious now that Saudi Arabia did not expect its mission in Yemen to last so long. In the course of two months of targeted and near-continuous bombings, it has encountered three challenges. First, the military plan is not achieving its stated goals. The air-only campaign is barely halting Houthi advances, let alone rolling them back. It is possible Saudi military planners took inspiration from similar campaigns, such as NATO’s in Serbia in 1999, in the hope of bringing the Houthis and their allies to a Saudi-run negotiating table without the quagmire of a ground campaign. As Israel learned in in Lebanon in 2006 and the US in Syria and Iraq in 2014, however, heavy and continuous air sorties do not necessarily bring about the intended political changes. Yet Saudi Arabia and its allies also have little appetite for a ground invasion, despite official professions of preparedness. Secondly, the kindgom does not seem to have a viable and inclusive political vision of how to bring the Yemeni war to an end. Its stated plan is based on the UN Security Council resolution 2216 (adopted in April), itself an endorsement of the Saudi political line. The resolution demands, among other things, withdrawal of the Houthis from all seized areas and the relinquishing of seized arms. Reflecting Saudi policy, it fails to consider the factors underlying the actions of the parties, the Houthis in particular. Withdrawing from the capital, Sana’a, and other occupied areas is a non-starter for the Houthis, who have little incentive to give up their gains. Adopting a maximalist position, in May Saudi Arabia organised peace talks in Riyadh, to which the Houthis were not invited and which they rejected—since the talks were held in the country leading the military coalition against them. Instead of changing the venue, the Saudis hosted only Yemeni factions close to the Hadi government in exile. While persuading (some would say cajoling) those parties to attend undoubtedly represented a herculean effort, it was a farcical episode in the absence of the Houthis or any representatives of the camp of the former president, Saleh. It portrayed Hadi and his government as increasingly removed from reality on the ground. 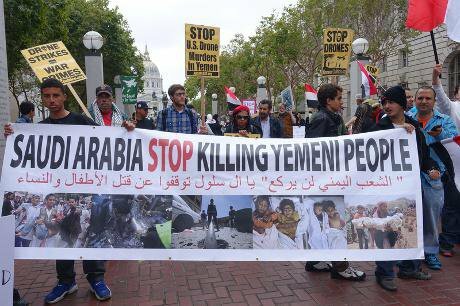 Losing the global argument: a demonstration in San Francisco against the air strikes. Demotix / Steve Rhodes. All rights reserved. Thirdly, the backdrop to the military campaign and the lacklustre political process is an increasingly dire humanitarian situation, in a country already suffering impoverishment and neglect. Since the start of the air campaign, UN agencies have reported more than 2,500 deaths, with over 1m people displaced and 21m in need of humanitarian assistance. Aid agencies have been hampered by the air and sea blockade, with Yemenis trapped between Houthi aggression on the ground and the Saudi-led air attacks—the relentless bombing has deprived 3m of access to clean drinking water. While Saudi Arabia has donated all the aid requested by the UN, this has made the country appear guilty for the war it is waging, facing criticism from the international humanitarian community and its western allies, while turning Yemeni public opinion against it—and, by extension, Hadi. The Saudi-led operation is not working. The Houthis are still in Sana’a and around Aden, and have been able to launch Scud missiles on Saudi soil. Given the humanitarian crisis, a political solution is urgently needed. The current talks in Geneva are an encouraging step. They are likely to focus on a cessation of hostilities but deeper issues should be discussed. The rival groups agree on the importance of the post-Saleh Yemeni National Dialogue, but remain at odds over whether and how power in Yemen should be federally distributed. Neither side trusts the other and both have pursued their narrow interests at the expense of a national agenda. The Houthis agree on the National Dialogue but reject its six-region federal proposal and call for a new Yemeni administration, while demanding an immediate, unconditional ceasefire by the Saudi-led coalition. Though they have legitimate concerns regarding the National Dialogue, the actions of the Houthis tend to discredit their stated aims and their revolutionary credentials from the 2011 popular uprising: the old Saleh regime, with whose forces they are now allied, sought to crush the uprising and they have enabled Saleh to return disruptively to the political scene. And they have publicly reached out to Iran for support. For his part, Hadi demands the implementation of UNSC resolution 2216, which will allow for the restoration of his government in Sana’a. Since his election in 2012, he has however shown weak leadership skills and exploited political developments to his own advantage. He initially allowed the Houthi military advance to crush his domestic political opponents in the north-western province of Sadaa, such as the Yemeni Muslim Brotherhood party ‘Islah’, by rejecting their appeals for military reinforcements. Hadi has sought external backing too, promptly receiving it from Saudi Arabia. While both sides accuse each other of seeking allies of convenience, it remains to be seen whether they can distance themselves from their factional agendas. They risk relinquishing the gains of the 2011 revolution and driving Yemen to a bloody collapse. While the Houthis and their allies did use force to take advantage of political instability in Yemen, regionalising what had been a domestic problem, Saudi Arabia now has a responsibility to help bring about an end to the crisis. For better or for worse, Saudi buy-in is a necessary, though not sufficient, condition. Riyadh’s acquiescence to a political deal, however, will not be without dangers. The kingdom has a long history of supporting autocratic regimes in the region. It is highly likely, therefore, that Saudi Arabia’s post-war involvement in Yemen will not respect the democratic aspirations of Yemenis and will hinge on installing, or re-installing, an allied leader and shaping a political system that, as far as possible, minimises the Houthis’ power. If Hadi were to be reinstated, his legitimacy further undermined by his handling of the crisis, he would probably be president in name only. As long as factionalism continues to drive Yemeni political groups, and as long as Yemeni politicians—however much they claim to work to realise the democratic aspirations of the Yemeni people—are willing to co-operate with outside powers or with the elite of old regimes to crush internal opponents, the country will be susceptible to a vicious power play. The current talks demand of Yemeni political leaders that they step up and be accountable to the citizenry. The challenge in Geneva remains to find a formula that will lead to an equitable and inclusive political transition, in which the interests and demands of the rival groups can be reconciled—and which Saudi Arabia is willing to live with.